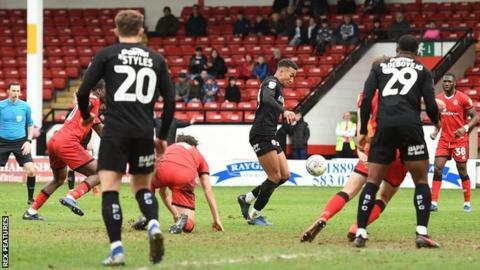 Barnsley boosted their hopes of automatic promotion as Jacob Brown's stoppage-time goal gave them victory at Walsall. The win extended second-placed Barnsley's unbeaten run in League One to 19 games and they also recorded a seventh clean sheet in a row. Walsall, though, could feel themselves hard done by, after creating the better chances and having a goal disallowed in the first half for a foul in the build-up before Isaiah Osbourne volleyed home. They also went close after the break when Corey Blackett-Taylor squeezed the ball past keeper Jack Walton, only for Ben Williams to stretch and hook it off the line. Barnsley boss Daniel Stendel had Cameron McGeehan and Brown back from suspension, but they were unable to impose themselves in midfield and Cauley Woodrow was an isolated figure up front for much of the game. After Blackett-Taylor's near miss, both Josh Gordon and the lively Zeli Ismail were thwarted by the feet of Walton, playing his first game since mid-November, in the space of a minute. Woodrow was denied by Roberts after finally creating an opportunity for himself from Mamadou Thiam's ball into the box. But the Saddlers keeper was unable to keep out Brown's effort as the Tykes claimed a crucial win, which left them four points clear of Portsmouth and five ahead of Sunderland, who have two games in hand, with Walsall remaining in the relegation places. Match ends, Walsall 0, Barnsley 1. Second Half ends, Walsall 0, Barnsley 1. Corner, Barnsley. Conceded by Nicky Devlin. Substitution, Walsall. Andy Cook replaces Isaiah Osbourne. Jacob Brown (Barnsley) is shown the yellow card for excessive celebration. Goal! Walsall 0, Barnsley 1. Jacob Brown (Barnsley) right footed shot from the centre of the box to the bottom left corner. Attempt blocked. Jacob Brown (Barnsley) right footed shot from the centre of the box is blocked. Foul by Callum Styles (Barnsley). Morgan Ferrier (Walsall) wins a free kick on the right wing. Jordan Green (Barnsley) is shown the yellow card for a bad foul. Foul by Jordan Green (Barnsley). Substitution, Barnsley. Jordan Green replaces Mamadou Thiam. Isaiah Osbourne (Walsall) wins a free kick on the left wing. George Dobson (Walsall) is shown the yellow card for a bad foul. Dimitri Kevin Cavaré (Barnsley) wins a free kick on the right wing. Jacob Brown (Barnsley) wins a free kick in the attacking half. Attempt saved. Cauley Woodrow (Barnsley) left footed shot from the left side of the box is saved in the centre of the goal. Attempt saved. Josh Gordon (Walsall) left footed shot from the centre of the box is saved in the centre of the goal. Substitution, Barnsley. Victor Adeboyejo replaces Cameron McGeehan. Attempt missed. Corey Taylor (Walsall) right footed shot from outside the box is close, but misses to the left. Attempt saved. Josh Gordon (Walsall) left footed shot from the left side of the box is saved in the centre of the goal. Corner, Barnsley. Conceded by Jon Guthrie. Attempt blocked. Callum Styles (Barnsley) right footed shot from outside the box is blocked. Substitution, Barnsley. Callum Styles replaces Mike-Steven Bähre. Attempt blocked. Liam Kinsella (Walsall) right footed shot from outside the box is blocked. Attempt blocked. Cameron McGeehan (Barnsley) right footed shot from the centre of the box is blocked. Attempt missed. Zeli Ismail (Walsall) right footed shot from the right side of the box misses to the left. Attempt saved. Corey Taylor (Walsall) right footed shot from the left side of the box is saved in the centre of the goal. Attempt missed. Mike-Steven Bähre (Barnsley) left footed shot from the centre of the box is just a bit too high. Mike-Steven Bähre (Barnsley) wins a free kick in the defensive half. Corner, Barnsley. Conceded by Dan Scarr.